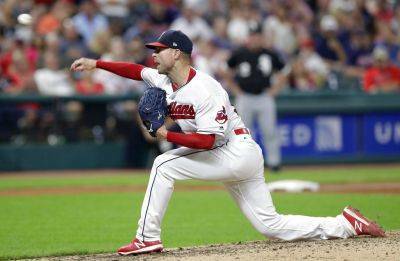 CLEVELAND — Corey Kluber struck out 11 in eight innings to record his career-high 19th win as the Cleveland Indians beat the Chicago White Sox 5-3 on Tuesday night. Kluber (19-7), who allowed three runs, topped 200 strikeouts for the fifth straight season. Kluber won 18 games in three of the previous four seasons, including his two AL Cy Young Award-winning years, 2014 and 2017. Omar Narvaez walked and Matt Davidson singled with two outs in the eighth, but Kluber retired Ryan LaMarre on a groundout. Indians All-Star second baseman Jose Ramirez was hit on the left arm by Carlos Rodon’s pitch in the fifth inning and walked from the plate in obvious pain. Ramirez spoke with manager Terry Francona and a team trainer, but stayed in the game. Jason Kipnis homered and Yandy Diaz added a two-run single when Cleveland scored three times in the fifth. Andrew Miller struck out three in the ninth but allowed the potential tying run to reach base. With one out, Welington Castillo reached on Yan Gomes’ passed ball on strike three. Miller struck out Yolmer Sanchez before Tim Anderson blooped a single to right. Miller then fanned Daniel Palka to end the game. The left-hander, who has been on the disabled list three times, picked up his second save and first since April 9. Carlos Rodon (6-6) allowed five runs in seven innings. Palka and Narvaez hit solo homers in the sixth for the White Sox. White Sox slugger Jose Abreu will miss the series because of an infection in his right thigh. Abreu is batting .320 (16 for 50) with five homers and 12 RBIs in his career against Kluber. Melky Cabrera’s RBI double and Yan Gomes’ run-scoring single gave Cleveland a 2-0 lead in the second. Josh Donaldson, who was acquired from Toronto on Aug. 31, drew a leadoff walk and scored from first on Cabrera’s hit. Donaldson also walked in the fourth, but was 0-for-2 and is batting .133 (2 for 15) in five games with Cleveland. Palka leads AL rookies with 25 home runs and has homered four times on Chicago’s road trip. In his previous start on Sept. 10, Kluber lasted only 1 2/3 innings and allowed four runs against Tampa Bay. His turn in the rotation was moved back a day to line him up to start Game 1 of the Division Series, which begins Oct. 5. The Indians rested most of their regulars Sunday, a day after clinching their third straight AL Central title. Francona returned to his usual lineup Tuesday night with the exception of designated hitter Edwin Encarnacion, who has missed the last two games after tweaking his ankle. White Sox: OF Nicky Delmonico (stiff neck) was a late scratch. He injured his neck Sunday while diving for a ball in Baltimore. Indians: Francona said Encarnacion will return today.